The Zazoo Photo Clock is really an amazing example of how technology has evolved and prices have dropped on multi-use photo frames. Where single use photo frames were once several hundred dollars, here is one that is kid-friendly, with a kid-friendly price that does so much more than just play a slideshow of photos. 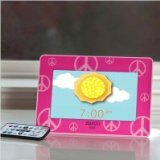 The Zazoo Photo Clock, invented by an entrepreneur mom, can act like a clock. One of it’s key features is the ability to wake your child with a specific image so they know it’s okay to get out of bed in the morning or after a nap. And it’s specifically designed so they understand the message with the choice of image, whether they can read or not. The Zazoo can also show photos or even movies with a simple menu system available through a remote or easy to use buttons on the back. And, if your child has MP3s he or she likes, it can play music off a memory stick or an SC card. It’s not meant to be an iPod, but for a small child, it does all the things a big kid gadget would do, but in an easy to manage package. Dads can imagine adding lullabies or other favorites to the playlist, even dad reading a story in the case of dads who are often away. There are several colors available from girlish pink to eco-friendly green. It comes with a remote control that can easily be used to move from screen to screen. On screen menu graphics, controlled also by buttons on the back, are a little weak in design (think bad engineering graphics) but you don’t really see these unless you are moving from movie to images, or changing the clock settings. On the back of the machine are two inputs for regular and mini-USB, as well as an SD/MMC/xD card reader, so it’s easy to plug in inexpensive flash memory of 2-4 gigs for music, images, or maybe even a movie, if you can put it in the right MP4 format. Note: not all MP4s work, but there is a troubleshooting section at Zazoo.com website. At $89 (slightly lower at Amazon), there are less expensive alarm clocks and photo frames, but when you factor in all the other uses, for some kids, the Zazoo will be the perfect gift under the tree.